where crafting feels sew good! Hello Again! I make a cute shaker card for my design team project for The Cutting Cafe. I used the Happy Easter Overlay Template and added acetate, foam and sequins/seed beads/tiny shapes to create the shaker. The file comes with the card base and a background piece so making a shaker was very easy. You can also just use the overlay on top of the backing sheet, making it with maybe glitter paper or patterned paper. Either way would be cute also. Make sure you stop by The Cutting Cafe Blog. We post design team projects on the 7th and 21st of each month. Leave a comment and you just might win three free files of your choice in a random drawing to be held on the following design team posting. It has been a while since I posted but I am slowly but surely coming back! We moved and I haven’t fully unpacked my craft room yet. But I am digging out things to do cards and projects for. This card is a design team project for The Cutting Cafe. It is the 3D Shadow Box Card Template and has many options, different shaped openings, layers, and sentiments. I chose to alter the size and make it 3 x 3 inches so I can use it as part of a swap that my friend Scrapdaworld is hosting. I added a glitter heart in the window but you can add pictures, sentiments, etc. Also, if you keep the embellishments relatively flat, you can fold the card flat and put it in an envelope. Be sure to stop by the blog to see everyone’s design team projects. We post on the 7th and 21st of each month. Leave a comment and you will be entered into a drawing to win three free files. Hello Everyone! Merry Christmas, Happy Holidays, and Happy Whatever You May Celebrate! Since it is a busy time for everyone, for this posting of design team projects for The Cutting Cafe, we were asked to reshare our favorite project we did for 2018. The typewriter card I created this summer for a staff person celebrating her 25th work anniversary was not my usual color palate but I loved the softness, but yet the sparkle of this card. I made it with the Typewriter Shaped Card file. To see my original post on this project, along with the video of it, click here. Be sure to visit the Cutting Cafe Blog to see other team member’s favorites. There may also be some new projects from the newer team members so you will have a mix of fantastic favorites along with some new favorites to view! When you visit, leave a comment on the design team post to be eligible to win three files from The Cutting Cafe in a drawing on the next design team post, which are done on the 7th and 21st of each month! Thanks for stopping by and I look forward to sharing more with you in 2019! Happy Holiday!!! There are many shapes in the file. this one is the flower. I kept it simple for the inside. This one uses cascading stars. Here is the inside of the star version. Be sure to stop by the Cutting Cafe Blog and view all of the design team projects. Leave a comment and be eligible to win three free files of your choice on the next design team posting. Thanks for stopping by and be sure to watch my video before you go! 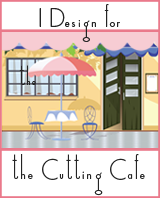 I am back with another design team project for The Cutting Cafe. This time I am using this cute Typewriter Shaped Card. I love this file as it is so very cute! Some of the team members this time are using another newer file, the Choo Choo Train Shaped Card. So be sure to stop by the blog and see what everyone has done. We post on the 7th and 21st of each month and with each posting you get a chance to win three free files just by posting a great comment! Here are a couple more pics of my card, which is for the one of my staff’s 25th anniversary with our company this week. I added a pocket to hold a gift card. Guess what?! It is Christmas in July at The Cutting Cafe! Both design team posts this month will feature Christmas. This week we are taking any of the animal shaped cards and turning them into a Christmas theme. I chose to work with the Owl Shaped Card Set. Make sure you visit the Cutting Cafe Blog to see all the design team projects. We post on the 7 and 21st of the month. Be sure to leave a comment to be entered into the drawing to win three free files on the 21st! The Cutting Cafe now offers custom word shaped card files! So if you have always wanted a name or phrase you could never find, now you can have a file made for you in a PDF or cutting file! Find the details here. For out design team projects, we got to have a custom file made for us to use. I chose the phrase, You’ve Got This. I also requested a couple sentiments, Don’t Give Up, GIrlfriend, and With God…. You can have a few sentiments too. This time I am using the card as a goodbye and good luck type of card so I did not use any of my sentiments. I just added a few velum/bling flowers and added clear glitter marker to every one of those polkadots! I am an association management professional who has always loved fashion, sewing, crafting, writing, cooking, and shopping. I am married to a wonderful man and have a great family foundation. I like to share inspiration with as well as get information from others and hope this site will let me do just that. Happy crafting!